Easy fishing! 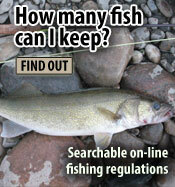 We've made it easier to figure out what fishing regulations are on your favorite lake! Our searchable Guide to Wisconsin hook and line fishing regulations (exit DNR) lets you search by inland lakes, by lake name or county and includes an interactive map. Give it a try and fish on...Wisconsin. People can fish year-round on some waters and for some species, but regulations set more limited open seasons for certain species and waters. Check our fishing seasons calendar as the seasons do not coincide with the calendar year. A current fishing license for the 2019-2020 season is required on April 1st, 2019.